HUGE SPIDER-MAN TRADING CARD POSTER ART (1994) Media Type: Pencil and Ink Art Type: Pinup Artist(s): Mark Bagley (pencils) Adam Hughes (pencils & inks) Check out this INCREDIBLE, HUGE published 1994 Spider-Man poster art which was created for the 1994 Mark Bagley Spider-Man card set! 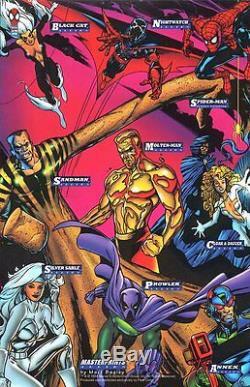 Most people thought Mark Bagley worked alone on this card set, but as you an see from this very large poster sized pinup, The great ADAM HUGHES had a MAJOR influence on this piece as well as Mark Bagley! There is stunning charcoal effects used in the background areas which Adam Hughes is so well known for! This HUGE piece is drawn on 1 piece of LARGE 17 by 23 inch art board! This 1 very large piece features 9 great cards from the card set for cards #73 - #81 featuring: 73. PLEASE see the extra image above for the 9 cards for the card set all side by side, as well as the limited edition "MASTERPRINT" poster card which is INCLUDED with the sale of the GREAT piece! 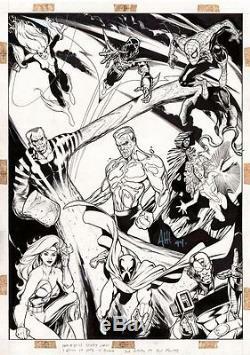 Just a great unique piece here, which is SIGNED in the center of the art by the great Adam Hughes, and is dated 1994! Just send us a message and we can try to work something out. Please find out more about me and my other items here. The item "Hughes, Adam SPIDER-MAN TRADING CARD POSTER Large Original Art (1994) BAGLEY" is in sale since Thursday, July 24, 2014. This item is in the category "Collectibles\Comics\Original Comic Art\Other Original Comic Art". The seller is "romitaman" and is located in Ravenna, Ohio. This item can be shipped worldwide.